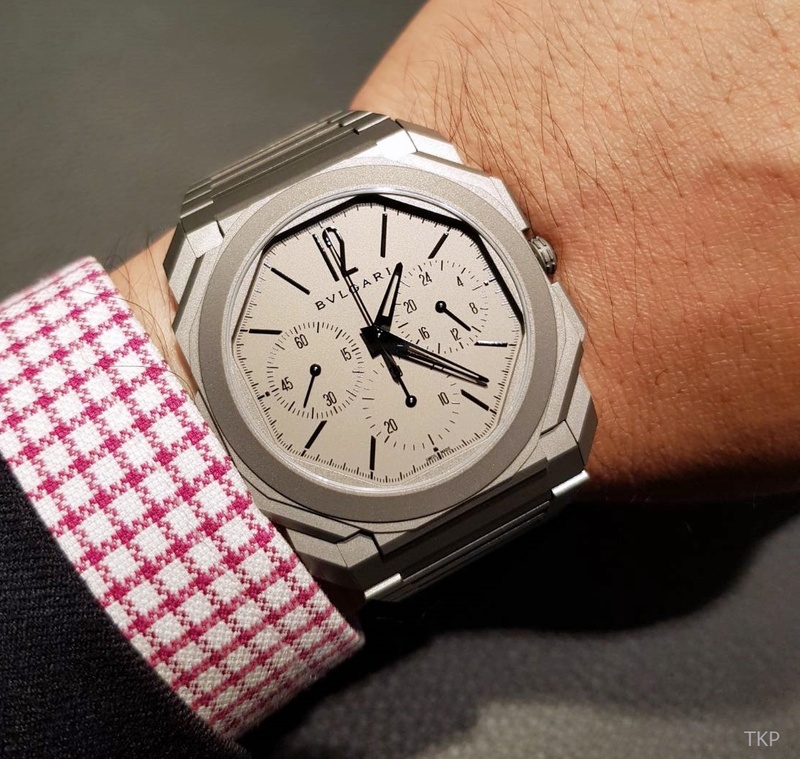 Launched in 2012, the Octo collection arguably didn’t pick up momentum until 2014, when it went into Piaget’s ultra-thin territory with its record-breaking manually wound Octo Finissimo Tourbillon. Since then, they have gone into overdrive and more than established their credentials as being serious about their watchmaking. In the process of pushing this particular boundary, they have broken a number of records for the thinness of their watches. This first Octo Finissimo was followed by the Octo Finissimo Minute Repeater, Finissimo Automatic, and the Tourbillon Automatic in 2018. At Baselworld 2019, the new Octo Finissimo Chronograph GMT Automatic continues this relentless pursuit of more records with a new (fifth) one. With a second time zone (GMT) function as well as the chronograph, exactly how thin is it? The 42mm titanium case is an astonishing 6.9mm thick, making it now the slimmest automatic watch with chronograph and GMT functions. 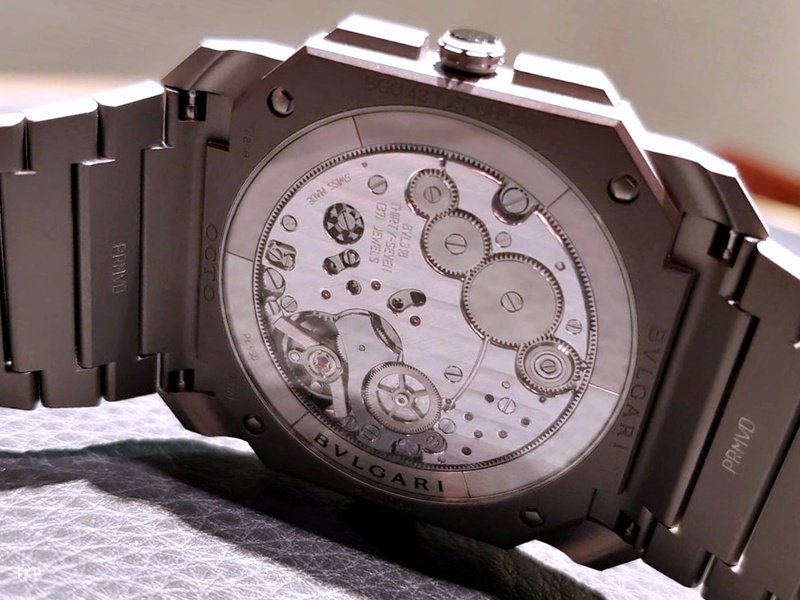 The automatic chronograph movement at the heart of this new watch is a scant 3.30 mm thick. The Calibre BVL 318 also has a platinum rotor. The chronograph function is operated, as per tradition, by pushers on either side of the crown, with its minutes totaliser sub dial at 6 o’clock. A small seconds sub dial is at 9 o’clock. The second time zone function is adjusted by pressing a pusher integrated into the case at 9 o’clock. The 24-hour home time is shown on the sub dial at 3 o’clock. One of the notable things about this watch apart from how thin it is, is that the pushers are so well incorporated into the design that they are barely distinguishable from the case. This has been a particular feature (and highlight) of the Octo Finissimo watches. It is not just thin but it’s also light, again using sandblasted titanium for both the watch and bracelet. The new Octo Finissimo Chronograph GMT Automatic has an RRP of 17,400 EUR.